Search: Category to show: All CategoriesSpices Go! A large mollusk of the genus Halotis, which means sea ear, referring to the flat shell. The edible part if the foot, or abductor muscle. Abalone was a favorite of Aristotle. Winter squash shaped like their namesake. Acorn Squash grow up to 6 inches in diameter and have deeply ridged, green skin and orange flesh. A sauce or paste made from a variety of ingredients that may include chiles, soy sauce, salt, vinegar,garlic and herbs. Adobo is a national dish of the Phillipines. It is also a cooking style and using in preparations with pork, chicken or fish. Dry adzuki beans are small dark red, oval beans approximately 5 mm in diameter. They have a distinctive white ridge along one side. Adzuki beans are popular across Asia, particularly in Japan, and are used to make red sweet bean paste. Foods cooked to the point that there is still some resistence; tender but slightly chewy. In Italian it means "to the tooth". Used mostly in reference to pasta, which should be cooked al dente, for most recipes. A type of tuna fish, with white meat and high fat content. Albacore is highly prized, the royalty of tuna. Classic brown sauce for venison made with red currant jelly and pine nuts. Comes from the latin word meaning "white"
Old fashion for egg whites. A rich sauce made of butter, cream, grated parmesean cheese and black pepper, and sometimes nutmeg. Alfredo Sauce is usually served over pasta. This is a specialty of the Alfredo Restaurant in Rome. The original owner is said to have invented the dish in 1914. An all-around flour that comes either "bleached" or "unbleached." The texture is fine. Similar in taste to a combination of nutmeg,cinnamon and cloves. 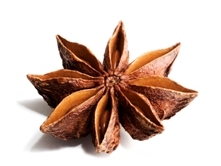 Allspice is usually sold dry either ground or whole. Oil made from pressing sweet almonds. A mixture of ground almonds, sugar and glycerin. Once regarded as a weed in America is now realized as a high protein plant. This plant was a stable of the Inca diet. The taste is a cross between a cabbage and spinach. Used in Asian cuisine. A small fish, somewhat like a herring; often used in appetizers. A smoke, heavily spiced pork sausage that is popular in Cajun recipes. A spice usually bought ground. It has a strong licorice flavor. An Italian word meaning \"before the meal.\" Antipasto is usually an assortment relishes,cheeses, sausages, anchovies, olives, marinated vegetables and other Italian specialties. Small serving of food served before or as a first course of a meal. Vegetables like onions, shallots, garlic, carrots,leeks and celery used primarily to give off their flavor and aroma to foods they are cooked with. A bitter and aromatic salad green. Good source of vitamin A and C.
Vitamin C. Used to keep fruit from turning color; often used in canning. A jelly made by chilling concentrated meat stock. Also, a jelly made by adding gelatin to meat or vegetable stock or fruit juice. A topping of browned crumbs or cheese. The natural pan drippings that comes from a roasting pan after deglazing. French term meaning "with milk." A pink sauce made by combining Bechamel (white sauce) with tomato puree. Avocados were first cultivated in South America with later migration to Mexico. It was believed that a Mayan princess ate the very first avocado and that it held mystical and magical powers. European sailors traveling to the New World used avocados as their form of butter. Avocados were first seen in the United States in the early 1800's. California is currently the largest producer of avocados stateside. There are more than 80 varieties, with the "Hass" variety dominating the crop share. A single mature avocado tree can produce more than 400 pieces of fruit in a year. Avocados are loaded with nutrients such as dietary fiber, vitamin B6, vitamin C, vitamin E, potassium, magnesium, and folate. They're also cholesterol and sodium free. Avocados contain 60% more potassium per ounce than bananas. This fruit is an excellent source of monounsaturated fat. To speed the ripening process, place the avocado in a paper bag, and store at room temperature until ready to eat (usually two to five days). Placing an apple together with the avocado speeds up the process even more. Cut the avocado in half, slightly twist the two halves, separate, and remove the seed. Starting at the small end and remove the skin with a knife, or, if you prefer, you can also scoop the flesh out with a spoon.